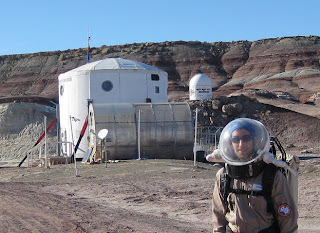 In January/February 2010, I was Commander for a two-week simulated Mars mission to the Mars Desert Research Station (MDRS) in Utah. 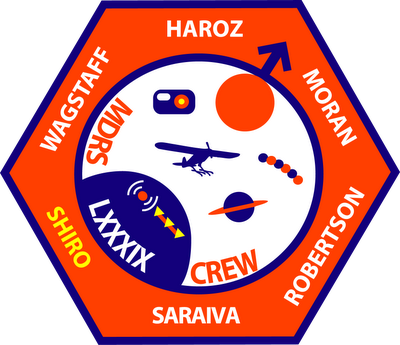 Throughout the Mars Society sponsored expedition, I posted regular dispatches from the field to my website astronautforhire.com. I've collected all of these "letters from Mars" on this page for easy reference along with the crew's other blog and video posts. Please contact me for media inquiries or to ask permission o use a photo. Thanks to everyone who followed me during the mission, especially those to chipped in to help pay for our expenses. On to Mars! Live action MDRS Crew 89! 07-24-10: Lunar Science Forum (poster pdf) 12-12-09: Meet the crew! For more news media articles featuring our crew, see this page. The five icons each stand for one of our science investigations. In clockwise order from the upper left, the camera stands for the automated digital photo geotagging experiment conducted by Geologist/Computer Scientist Kiri Wagstaff. The plane with feet represents a remotely-controlled aerial reconnaissance vehicle (with feet for landing) that Engineer Darrel Robertson planned to use for help in planning Extra-Vehicular Activities (EVas). The string of colored circles stands for the extremophiles and endoliths that Biologist Luís Saraiva sampled and studied. The planet with rings represents Astronomer Mike Moran’s observations; he originally planned to observe exoplanets with the optical telescope, but as it was out of commission he instead devoted his time to upgrading the radio telescope and then observing emissions from Jupiter. The string of triangles on the ground stands for Commander Brian Shiro’s seismic study, which made use of a 55-foot land streamer containing 12 geophones.